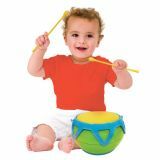 Help little ones discover the soothing rhythms of tropical music with this vibrantly-colored set, including maracas, a cage bell, and a tambourine. 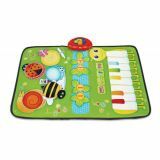 Musical floor play with drums and keyboard. 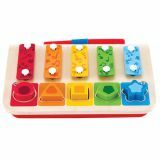 Caterpillar keyboard can play 4 instruments. On/off switch and volume control. 2 "AA" batteries required (not included). 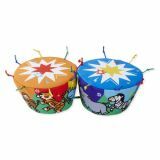 Kids will have a great time keeping the beat with these soft and colorful cloth-covered bongo drums! 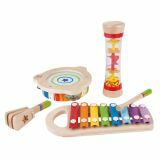 Includes five wooden puzzle pieces, one baton, and a xylophone/piano base, and is a piano, xylophone and shape sorting game all rolled into one bright and engaging product. 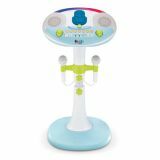 Everyone can sing their favorite Karaoke songs with this feature-filled pedestal! 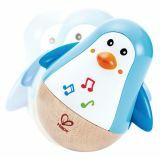 Up to 3 minutes of recording capability, 6 fun, voice changing effects, connects to Bluetooth, stand expands to 40", detaches, includes adapter, but not the required 4 C batteries. The unique design with an elastic head means each beat produces a beautiful deep professional tone, so every tiny drummer really feels like part of the band as they develop their natural rhythmic skills. Everything needed for an afternoon jam session! 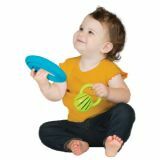 This music set is perfect for young musicians to explore and discover their talents.